The arrival of the MGC in 1967 was greeted with mixed reactions both from enthusiasts and the motoring press. It can be described as one of the most controversial sports cars ever produced from Abingdon and during its short life (1967-1969) the car was never short of attention, particularly from the press. The arrival of the MGC was partly due to the flagging sales of the Austin Healey 3000 and the fact that the original design of the MGB mono-coque structure was capable of taking larger power units than the 1800 cc engine. It is worth noting however that the MGB suspension, engine bay and general layout were configured for the 1800 cc unit and the idea of fitting heavier, larger and more powerful engines was discounted at first for fear of upsetting the excellent overall balance the car possessed. BMC's policy was not at all clear in the mid 60s in relation to sports cars. There was talk of a modified Austin Healey with different engines and the possibilities of a new joint model badge engineered, but based on the MGB. Alongside this, there was in the planning stage an Austin designed sports car with Hydrolastic suspension and a Rolls Royce engine, which never got off the ground. It was decided eventually to drop the 'Big' Healey 3000 in favour of an MGB derivative with a similar sized six cylinder engine to the Healey, although technically speaking the only similarity between the Healey and the new MG was in the basic design of the 3 litre engine. BMC were looking at larger engine versions of the MGB as early as 1963 and they wanted to see a car marketed in both MG and Austin Healey forms, in line with their current policy on badge engineering. Both Geoffrey and Donald Healey were engaged to work on the new concept. The two projects were code named ADO 51 for the Healey version of the new derivative and ADO 52 for the MG version. There was to be very little difference between the two cars and prototypes of the Healeys showed only minor changes to the front of the car, mainly to the grille. The choice of engine was not easily decided. The existing 3 litre unit used in the Healey 3000 was deemed unsuitable as it stood and a refined version of the four cylinder 2.6 litre Austin Healey engine was suggested but promptly rejected. There was also an idea to use an Australian version of BMC's 2,433 cc six cylinder unit, which utilised triple SU carburettors and was basically a development from the four cylinder B series engine. This was not taken up because of too many political, spares/service and economic problems. During 1967 BMC and Jaguar merged to form the short-lived British Motor Holdings and the MG Car Company became the MG Division. Because of the continuing rationalisation there was approval for the production of a new 3 litre saloon known as ADO 61, ultimately to appear with an Austin badge. It was because of this that a major redesign of the 3 litre engine was undertaken by Syd Enever and his team and for obvious reasons it was to be this engine that would be fitted to the new MG/Austin Healey sports car and the Austin saloon. It was felt that the engine could be made considerably lighter and smaller particularly with the new casting techniques that had been introduced in the early 60s allowing thinner bore walls etc. With the 3 litre engine originally weighing in at 611 lbs it was felt that the weight could be reduced to nearer 500 lbs with no problem. In the event the engine which was built by BMC engine division at Coventry ended up only 44 lbs lighter and was a mighty 209 lbs heavier than the standard 'B' series engine. Superficially the new engine looked similar to the Healey 3000 engine but it now boasted seven main bearings instead of four, allowing smoother high revving. The carburettors and manifolding were on the nearside of the car with the electrical ancillaries and distributor on the offside. The overall saving in length in the redesigned engine (approx. 13/4") allowed the engine to be squeezed into the MGB engine bay, but only just! It was necessary however to modify the bonnet with the now characteristic bulge to accommodate the radiator and an extra small fairing to provide clearance for the front SU carburettor. The announcement of the two models, ADO 51 and ADO 52 was scheduled for the autumn of 1967 at the Motor Show with the original production being sanctioned as early as 1964. Donald Healey was never happy about a badge engineered MGC carrying his illustrious name and it was only after both models had been released for production in the autumn of 1966 that the intended Austin Healey 3000 Mark IV was dropped. BMC tried very hard to persuade Healey to agree to his name being used on ADO 51 and several attempts were made to upgrade the car to a standard that was acceptable, all to no avail. Efforts were then concentrated on ADO 52 with the first true production cars being built in July 1967. The MGC looked similar to the MGB and certainly shared most of the body panels, chromework, trim and many inner structural members. There were however obvious and important engineering differences to make the installation of the hefty six cylinder engine possible and changes to the running gear to cope with the extra power. In its final form the engine developed 145bhp @ 5,200rpm and 1701b/ft of torque @ 3,400rpm which was a 50% increase over the standard B series engine. There was an all-new full synchromesh gearbox which was shared with the new Mark II MGB that was launched at the same time. The engineering team led by Syd Enever had many problems with the fitting of the engine, particularly as the decision was taken to offer the car with Borg Warner automatic transmission as well. The model 35 automatic gearbox was fairly bulky and theoretically should have been mounted further back in the chassis to give more even weight distribution, but this would have necessitated enlarging the transmission tunnel, modifying the bulkhead and resiting the heater assembly. This would in turn cause the size of the passenger compartment to be reduced which was rejected in the interests of comfort and keeping costs to a minimum. In the end the weight distribution suffered to the extent of 55.7% in the front and 44.3% in the rear against the MGB's 52.5% front; 47.5% rear. The front suspension had to be redesigned extensively to make room for the engine as the existing MGB cross member fouled the sump. Torsion bars were employed instead of coil springs with anchorages located on the floorpan under the seats, which gave a far firmer suspension than the MGB. Telescopic dampers were used at the front in place of the hydraulic lever arm type because they were able to handle the additional weight that was concentrated over the front axle line. There were only minor changes to the rear suspension but the MGC employed Girling instead of Lockheed brakes which were increased in size at the front to 11 " discs and reduced at the rear to 9" x 21/2". Larger 15" wheels were fitted with 5" rims to cope with the car's additional performance potential. A stronger tubular Salisbury type rear axle in common with the latest MGB's had various ratios at different stages of production. An option of Laycock overdrive which was operative on third and top gears completed the package. When announced in October 1967 the MGC was available in roadster form at £1,102 and in GT form at £1,249 and was considered very reasonably priced for one of the fastest production MGs produced. The main drawback was in the way that the power was delivered. With a top speed of around 120mph and fast but not dramatic acceleration, the engine showed a lack of low speed torque and refused to rev freely. The car as a result received a very indifferent press reception particularly as some of the press fleet were badly presented. Some of the criticisms that were levelled in a series of unenthusiastic road tests carried out by the motoring press concerned the gearbox, heavy fuel consumption, general lethargy, heavy steering, enormous steering wheel and probably worst of all the tendency to understeer due to the increased front end weight. The MGC received probably the harshest reception that any MG had ever experienced and after such comments as 'pig-like understeer' and 'gutless' the points in the car's favour were its refined cruising ability and its comfortable ride. If used as a relaxed high speed tourer the MGC was a civilised motor car. A two year production span was all the MGC enjoyed before being withdrawn in September 1969 with a total of 8,999 cars being built; 4,542 were roadsters and 4,457 were in GT form. 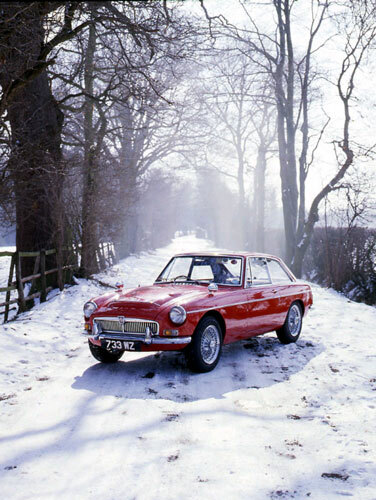 200 unsold MGC GTs were purchased by London's largest MG agent, University Motors and were modified both cos-metically and some had effective Downton engine conversions which gave improved power, torque and fuel economy. They sold steadily during 1969 and 1970 and are now much sought after. Clutch & Gearbox: Four speed all synchromesh with single plate Borg & Beck 9" clutch. Optional Laycock overdrive. Suspension: Independent front by wishbone and adjustable torsion bar. Anti roll bar and telescopic hydraulic dampers. Rear; Live axle, half elliptic leaf springs and hydraulic lever arm dampers. Brakes: Girling front disc and rear wheel drum with vacuum servo assistance. Wheels and Tyres: Pressed steel disc with five stud fixing. Optional centre lock wire spoke wheels. All with 5" rims. Tyres: 165 HR 15 radial. Dimensions: Front track; 4'2". Rear track; 4'1.25". Performance: 0-60 in 10 secs. Fuel consumption: approx 19.3 mpg.